Brunswick's Jewell Station Precinct redevelopment has progressed with the master plan currently open to public comment. A joint project between land owner VicTrack and property developer Neometro, Jewell Station Precinct forms part of VicTrack’s Station Precinct Enhancement program which seeks to cede under-utilised VicTrack-owned land to developers for renewal. In turn proceeds from the redevelopment of Jewell Station Precinct will allow VicTrack to fund the revitalisation of the station forecourt, creating a safer and more accessible transport hub. 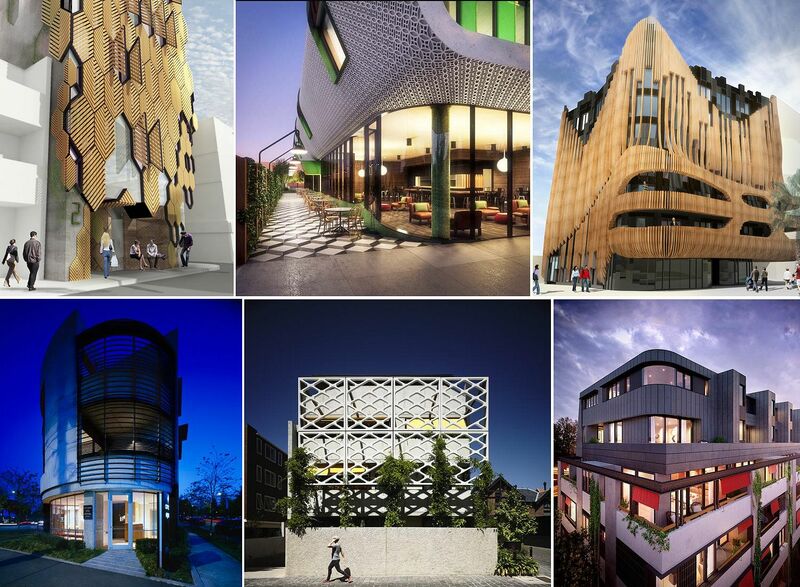 BKK Architects, McAllister Alcock Architects and landscape/urban design practice Glas form the design team appointed to create "A community asset that becomes part of the cultural fabric of Brunswick, ”according to Neometro Director James Tutton​. As seen below both architecture firms are more than capable of creating highly distinctive, small to medium scale developments that also deliver quality urban design outcomes. The station entrance, currently dominated by a large asphalt area, is proposed to be reactivated by a grand staircase with integrated seating, where commuters and residents can sit and take in the precinct’s public art features, public square and enjoy an elevated café terrace looking down Wilson Avenue. This public square is imagined as a flexible space that will evolve with needs of the local community, offering infrastructure to host small events such as pop-up concerts and market stalls. The Upfield cycle path will be significantly improved to increase safety for pedestrians and cyclists. Rumble strips and slopes will be added to the station’s approach in both directions to slow cyclists and prevent collisions, while clearer markings will highlight to pedestrians the shared nature of the path. Bike facilities, such as pumps for flats and bike racks, are also suggested within the precinct. Community gardens and two apartment buildings designed with Neometro’s signature passion for great design and architecture will bookend the northern and southern ends of the site. At a proposed eight levels each, the buildings have been designed in accordance with the Brunswick Structure Plan and will feature various commercial spaces and flexible studios at the ground floor interface. The western side of the station will see improvements to the public park with lighting, picnic areas, a larger community garden to increase the safety and amenity. Proposed parcel pick-up locker facilities will allow nearby residents to collect deliveries on the way home. A dedicated space is also proposed to service the nearby RMIT campus, which will be asked to outline its desires for the site. VicTrack's initial attempt at station enhancement is more a tale of woe. Seen above left was the initial design created by NH Architecture for a Glen Waverley Station residential block, which ultimately morphed into a disappointing urban outcome when completed at the turn of 2014. Teaming with Consolidated Properties, Ikon Glen Waverley looks to be more an attempt at cost cutting and maximising profits rather than delivering a lasting positive urban outcome. 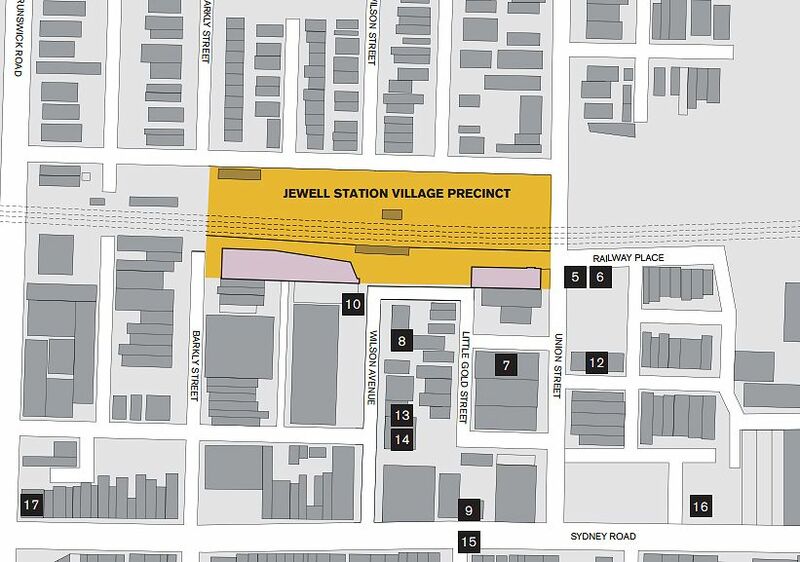 How will Jewell Station Precinct provide a better outcome? With Neometro comes a very different ethos to development, emphasised by their B Corporation status achieved in 2013. Success for us is defined by the delivery of social, community and financial outcomes. Jewell Station is the perfect canvas for this approach. The transformation of this precinct will give locals and the wider community a beautiful, safe, creative and active space to play and live in. The hope of course is a far superior outcome to that of Glen Waverley. A period of community feedback for Jewell Station Precinct is now underway with the wider public able and encouraged to provide commentary which will ultimately help refine plans prior to their submission for approval. Will they be sinking the tracks and provisioning for future expansion? That's what I wondered, the whole stretch of the Upfield Line from Park Street to Bell Street is littered with level crossings - many of them likely not to be as high priority as others around the metro (possible exception: Bell Street). There should be provision made along this entire line for it to be placed underground with many of the historic railway stations used for community purpose following the opening of the new facilities. Since putting the Upfield Line underground is the most expensive way of dealing with the extremely high number of level crossings, why focus on that way of doing it? Elevating the tracks would be far more cost effective. It's a relatively narrow corridor with a lot of industrially zoned land along it. The development potential of the rail reserve is relatively low, given the narrowness of the reserve and the lack of access to it. Thus, the main benefit of lowering the line would be to provide open space and a better space for cycling and walking. Given these conditions, elevating the tracks would provide a better outcome: it would allow some open space to be created, along with much-needed improvements for pedestrians and cyclists and allow low-scale development beneath the viaduct on some of the land, which would provide more activity during the day and night to make it safer. The heritage-listed station buildings could be refurbished as community facilities. In those sections where the corridor is wider / connected to public open space - such as around the northern edge of Royal Park, Jewell Station, Anstey Station, Moreland Station, Coburg and Batman, the public space could be made continuous at ground level rather than bisected as it is by the tracks. This would make the corridor much more connected and raise levels of amenity significantly. This development at Jewell, and the recently completed Commons at Anstey would obviously have to cope with a change of outlook, but should the views of a few residents be allowed to compromise the entire corridor and force the state to spend far more money for what would not necessarily be a better outcome overall? Welcome Ian - I've seen You present on your work and I hope you keep fighting the good fight!! Hope you've been able to brief the incoming government on your work and/or the new level crossing removal authoirty people. Thanks for the warm reception, John! I'm working on it, is all I can say. But I'm also keen to get engagement from local governments and communities, especially residents groups. It's been assumptions about what people will and won't like that seems to have driven decision-making in the last decade or so.